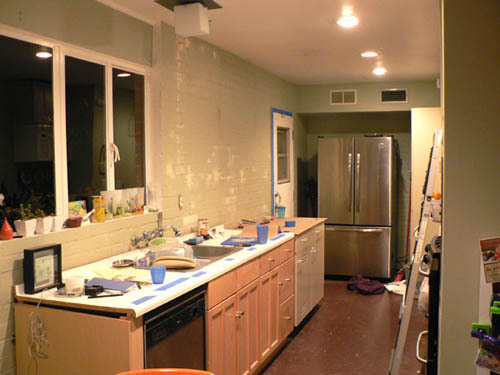 Out of anyone who has ever been daunted by the thought of renovating their kitchen, we were the poster children. We love to cook, and we love to prep and entertain side by side as a couple; the kitchen we inherited just wasn't letting us do that very well. 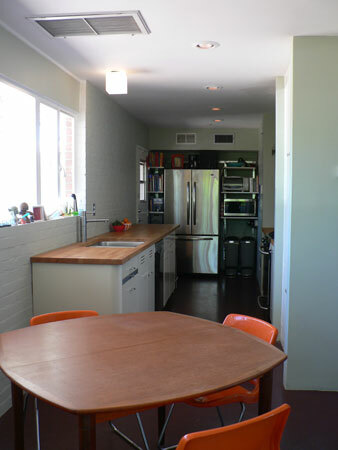 And so, after seeing the great success of IKEA kitchen cabinets installed in our friend's homes and on Modern Phoenix Home Tours, we decided to take the plunge. It was within our price point and decently built. Done. But standing there trying to select cabinet faces on the showroom floor I began to have regrets. 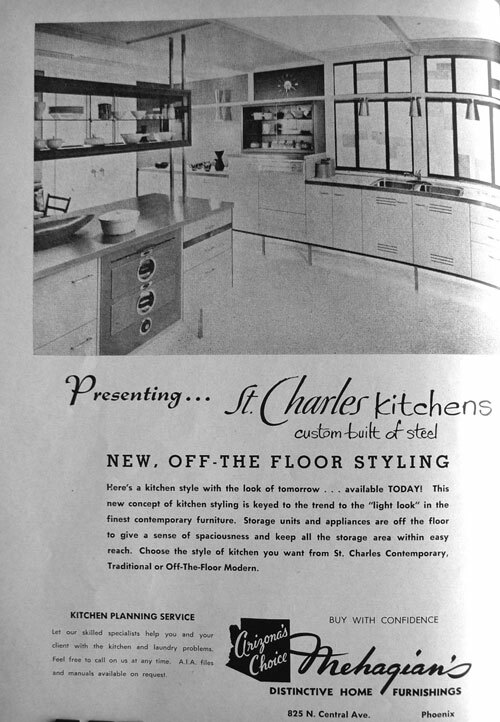 I was haunted by a St. Charles ad I'd seen in an old AIA magazine. 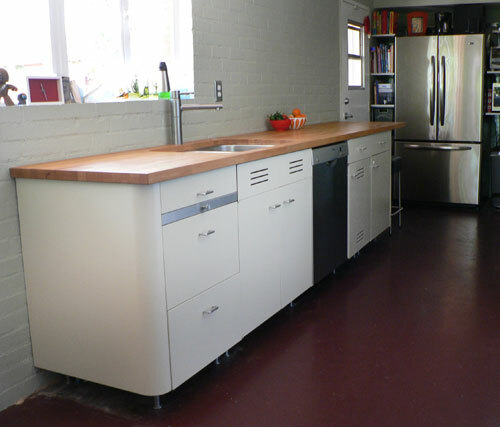 Floating steel cabinets. I had already searched online for vintage steel cabinets with no success. Yet something nagged me that we hadn't tried hard enough. We hightailed it out of IKEA and I got back online. Within five minutes I'd found the message boards at retrorenovation.com and located a fellow one mile away trying to find a good owner for his St. Charles steel cabinets — which were conveniently being removed in three weeks. We rushed over to photograph and measure the set. 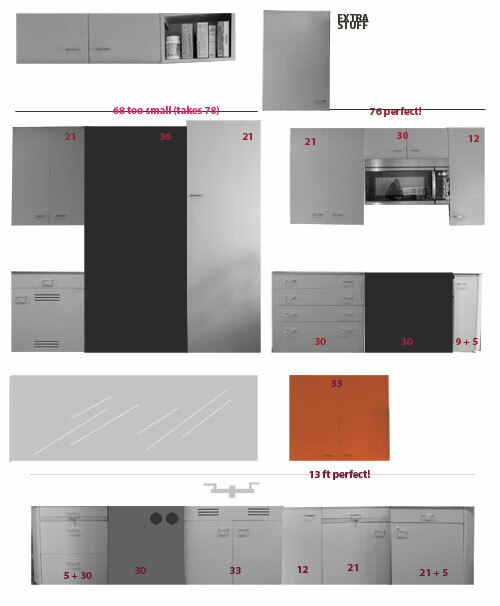 A little Sloppy-Photoshoppy confirmed that we'd not only have enough to do our kitchen but also plenty left over. Sold! And for significantly less than IKEA would have cost us. All it would take was a little sweat equity, right?!? Riiiight. So rewind 63 years. 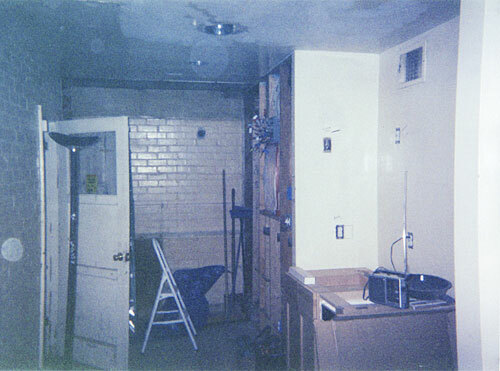 Here's the 1946 era kitchen in the earliest known photos in the 90s. We didn't live here at the time. 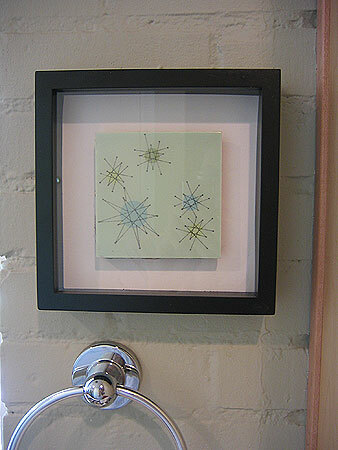 It has green tile with sputnik style accent tiles and backsplash, undermounted porcelain (?) sink, wall-mounted faucet, and white painted wood built-in cabinets. 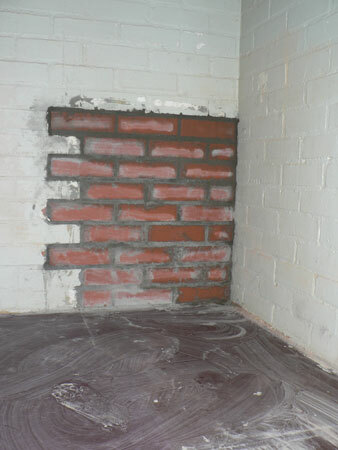 Looks like the butler pantry area at the back has already been ripped up to accommodate the soffit for the A/C. If we'd moved into the home with the kitchen in this state we'd probably have kept it, but who knows what shape it was in, and it is long gone. 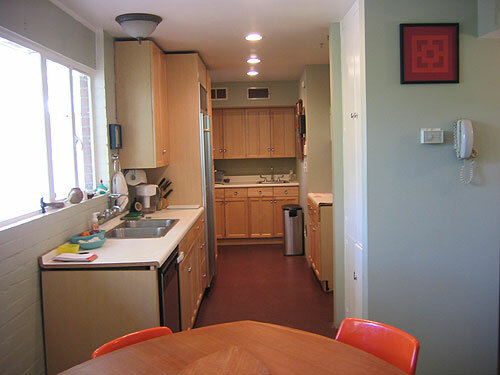 In the early 2000s, Home Depot salvaged cabinets were installed with Formica countertops that were never really attached to the cabinets in the first place. Matthew delighted in the fact that whenever he got a utensil jammed in the drawer, all he had to do was lift the Formica. 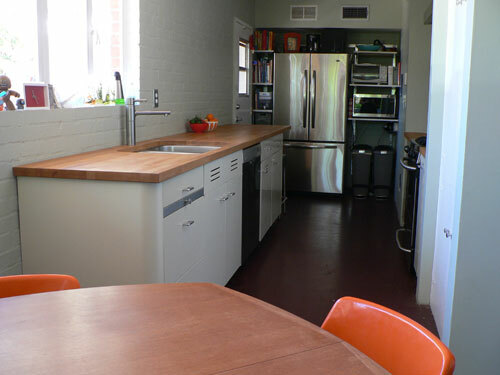 To previous owner's credit, they wanted to redo the counters before we bought the place but we insisted that it would be time and resources wasted, we wanted to do it ourselves. And so, we lived with it as we worked on other projects. And lived with it. And lived with it, until there were no more small projects to do and it was time to move ahead. So now's the payoff shot in case we haven't lost you already. It was completely worth it. Like childbirth, we have largely blocked out the painful moments, like this: If anyone wondered why we hadn't entertained anyone all summer, it probably had something to do with the re-enactment of the beaches of Normandy in our front entryway. It took THAT much experimentation to get the ductwork to connect our new exhaust fan and avoid cutting a whole new hole in the roof. Here's the calm before the storm. I say that the timing was right, but we really didn't have any choice. We had been procrastinating on this job for years, but the real kick in the pants came when our 80's era SubZero fridge punked out on a hot spring night. New refridgerator led to a whole new kitchen design whether we we ready or not. Why? The new fridge didn't fit in the old spot. 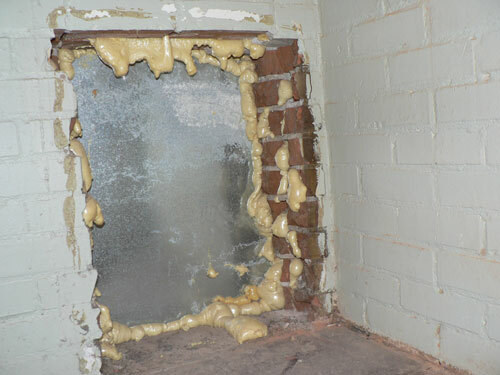 This small oversight led to us ripping out the pantry area so we could install it there, only to discover a HOLE! In the brick wall!!! 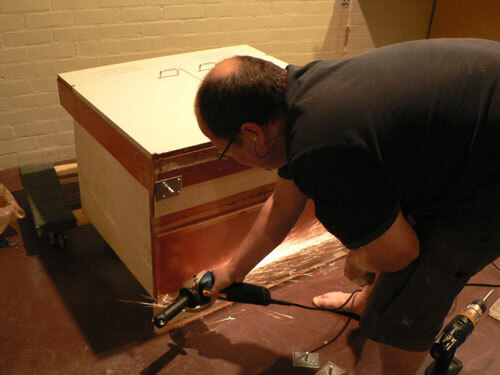 A recent one, too, using common expansion foam to seal the cracks. Project delayed a few days, we had a professional mason help patch up the situation. We still have no idea why there was a hole leading to the area currently occupied by our water heater in the laundry room. 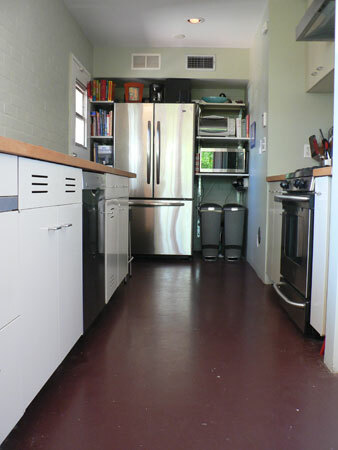 A fresh coat of paint on the back pantry area, repositioning of our deeper-than-realized new fridge, and installation of the first St. Charles cabinet at the end of our new huge prep area made us feel like we were really making progress. 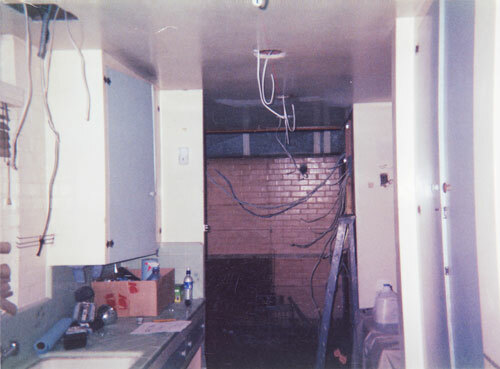 Blue tape on the formica marked where each new cabinet would replace the old.At this point, we began to notice how beautiful the uninterrupted brick wall texture was, and consider life without upper cabinets. I lived with it for a day or two (somewhat anxiously – really, who lives without uppers?) and then agreed; we should scrape down and patch up the divots in the wall as if it may never see upper cabinets ever again. 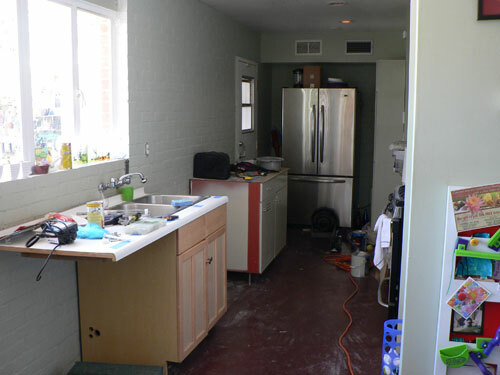 Much Durham's Rock Hard Water Putty patching and grinding later, and we could see that original kitchen paint color was tan. Bleh. Chisel, chisel, chisel. 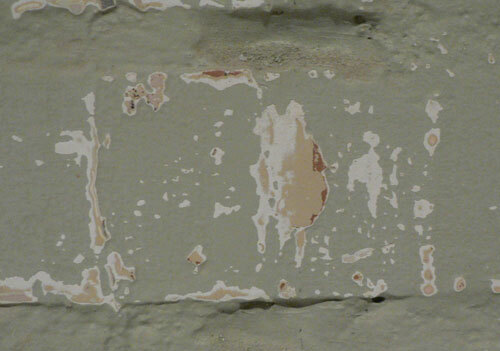 A fresh coat of paint later, and the wall was perfect enough to eat off. 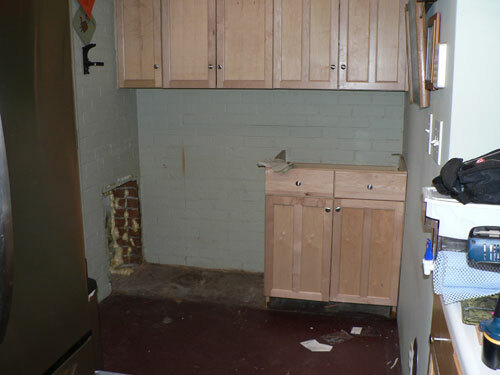 The dishwasher and more old undercabinets were removed. Naturally the new sink, faucet and dishwasher deliveries were delayed and don't arrive in time for installation over the long holiday weekend, so we were stranded without a garbage disposal or dishwasher, and nothing to do but work on the rest of the cabinets. 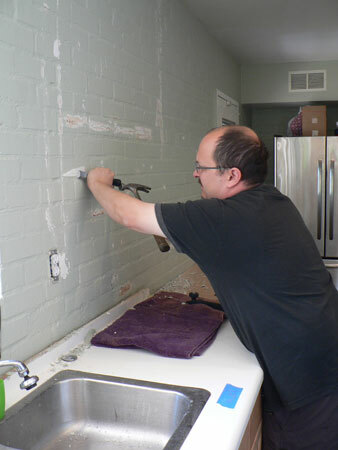 Matthew also removed the wall-mounted sink fixture which, while quaint and truly vintage, was not performing well. IKEA did work its way back into the picture in the end. 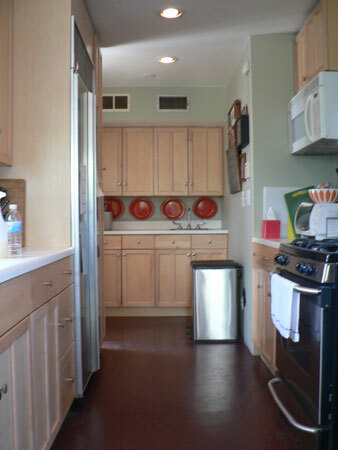 Their cabinetry legs were perfectly compatible to achieve that floating St. Charles cabinet look. You have to be licking my floors to even see them, so they were a great fit. 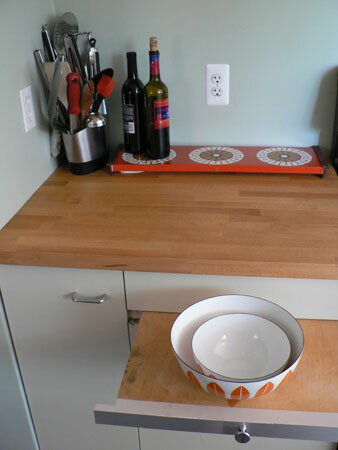 We also used beech butcher block from IKEA to top the counters until we could use the Richlite we had our eye on. 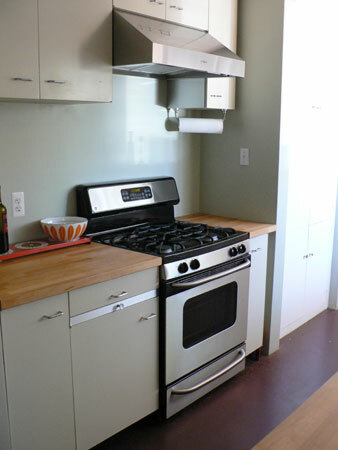 The butcher block has performed amazingly well and we're not really thinking about replacing it at all anymore. We cantilevered a small breakfast bar down at the end near the fridge, were we eat snacks and our son does his homework. Finally done! It took months of planning and deliberation and almost a year to call it complete. We are absolutely thrilled with our St. Charles cabinets and all the cool features they came with, including two pullout cutting boards which our son uses as prep stations so he can cook with us too. The best part is, they look as if they have been here the entire time. 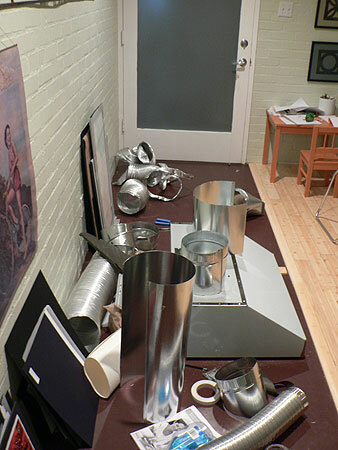 If you didn't know the hell we'd been through, and weren't a steel cabinet aficionado to boot, you'd think it was merely an updated original installation. Not to mention (being all-steel) it is 100% recycled salvage and 100% recyclable in the future! Now that's a proper galley! 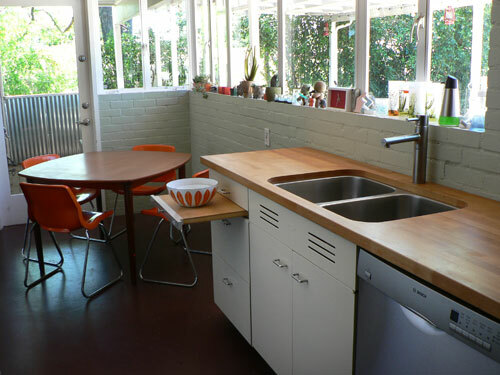 If you have ever considered the possibility of recycling vintage kitchen cabinets in your own midcentury-era home, we highly recommend it. 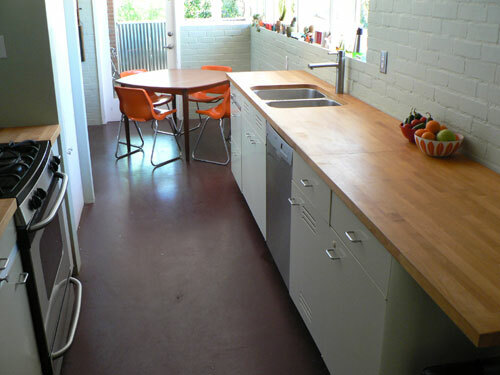 Visit RetroRenovation's forums and see if you can find the kitchen of your dreams like we did!